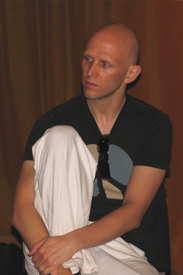 Wayne McGregor CBE, Artistic Director of Studio Wayne McGregor and Resident Choreographer of The Royal Ballet, has been named as the new Vice President of Elmhurst Ballet School. The appointment marks the commencement of an exciting new partnership between the school and Studio Wayne McGregor, and he is the latest to join dance luminaries Carlos Acosta CBE, Maina Gielgud AO, Dame Merle Park DBE and Sir Peter Wright CBE as vice presidents of the school. Studio Wayne McGregor and the school have planned a programme of activities, creating opportunities for Elmhurst students to work with its artists and explore Wayne McGregor’s choreographic repertoire and process. 2018/19 saw the commencement of the newly created Elmhurst Ballet Company, which was granted permission to perform an excerpt from Wayne McGregor’s Entity. Future plans include a new work to be created with Elmhurst Ballet Company in Birmingham and London in 2020. Company Wayne McGregor dancers will also work with students from across the school, from Year 7 through to the graduate year, to create work for the School’s performance series. Other opportunities for students to work with Studio Wayne McGregor include talks by Wayne McGregor, mentoring and buddying opportunities between upcoming graduates and Company Wayne McGregor dancers, audition preparation workshops for Upper School students, and the opportunity for Elmhurst Ballet Company members to take company class at Studio Wayne McGregor. There will also be a possibility for Elmhurst students to be involved in Studio Wayne McGregor’s professional development. Wayne McGregor is a multi-award-winning British choreographer and director, internationally renowned for innovations in performance that have radically redefined dance in the modern era. Wayne’s experiments have led him into collaborative dialogue with an array of artistic forms, scientific disciplines, and technological interventions. The multi-dimensional works resulting from these interactions have ensured his position at the cutting edge of contemporary arts for over twenty-five years.